Massive security arrangements have been made across the state to conduct the ensuing Lok Sabha elections for two seats of Tripura in free and fair manner. Addressing a press conference here at Agartala Police Headquarter this afternoon the Director General of Police A K Shukla has informed this. He also informed that Tripura police along with central armed forces are deployed every nook and corner of the state to ensure free and fare election. He also said that a strict instructions were issued to district superintendents of police to ensure firm legal action while handling any law and order situation. 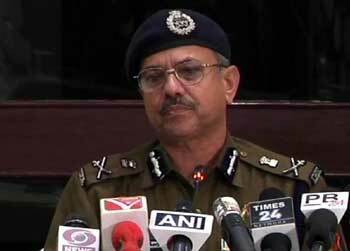 The Director General of Police also added that since after the announcement of Lok Sabha election on March 10th this year, a total of 1395 non-bailable and permanent arrest warrants were executed. He informed that binding down of potential trouble mongers are in full swing so as to ensure free and fare election. With an aim to ensure a violence-free Lok Sabha elections, the Tripura Police would publicly display the names and antecedents of criminals against whom arrest warrants were pending. while saying this to the media in a press conference the DG said so that the people can identify them and help the police arrest the wanted people, the names of those criminals shall be displayed at large.